If your doctor has told you that you have high intraocular pressure, or if you might have the beginning stages of glaucoma, then you will want to read the information below. Many people think that glaucoma is an eye disease that affects only seniors. This is not true. Glaucoma can strike even those in their early thirties. Many of you may remember a famous Minnesota Twins baseball player named Kirby Puckett. In 1995 Kirby Puckett was the MVP of the World Series, and the next year he was blind in one eye. At the age of 35, his baseball career was over. This was absolutely catastrophic for the Minnesota Twins, their fans, Kirby Puckett and his friends and family. Let the story of this baseball legend be a lesson regarding regular eye exams. Regular eye exams can save your vision, because glaucoma is the leading cause of preventable blindness in the United States. Many eye care patients are surprised when they learn that, according to the American Academy of Ophthalmology, almost 2.5 million Americans have glaucoma. More than half of these people do not even realize they have the disease, because glaucoma is asymptomatic in early stages. As previously mentioned, glaucoma is known as the “silent thief of sight”, because it silently steals your vision. Glaucoma often goes undiagnosed because there is no pain associated with this high intraocular pressure. Patients are urged to have routine eye exams to check the status of their general eye health. In a general eye exam, glaucoma tests can be performed, and the health of the retina can also be checked. Glaucoma is the second leading cause of blindness in the U.S., but it is the leading cause of preventable blindness. According to the American Academy of Ophthalmology, approximately 2.2 million Americans age 40 and older have glaucoma. Glaucoma is an eye disease where the intraocular pressure in the eye increases and can eventually cause damage to the optic nerve, ultimately leading to vision loss if untreated. As previously mentioned, vision loss will occur with absolutely no warning signs or symptoms. The optic nerve is like a fine wire that connects the retina and the images we see to the brain. 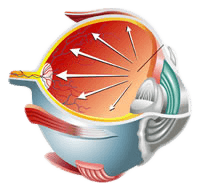 Damage to the optic nerve can occur when the pressure within the eye increases, usually due to a build-up of aqueous fluid inside the eye. This leads to the development of blind spots in our field of vision. As you probably realize glaucoma is a very serious disease that requires medical eye care attention. The good news for Ft. Worth area glaucoma patients is that the doctors at the Texas Eye and Laser Center can help diagnose and treat this disease. Patients who have glaucoma or glaucoma-like symptoms will benefit from the HRT II test, an instrument that uses a scanning laser to create an image of the optic nerve. It helps your eye doctor monitor the optic nerve for changes, thereby aiding diagnosis and assisting follow-up of the disease. Before consulting you about glaucoma, the doctors at Texas Eye and Laser Center will require you to come in for an eye exam. The doctors will design a treatment plan based on your specific situation. Typically a medical approach using eye drops is the first line of treatment. For these eye drops to work, you must take them regularly and continuously. Many patients have difficulty taking eye drops on a regular basis. Glaucoma eye drop medications can have side effects. You should notify your eye doctor immediately if you think you experience side effects. 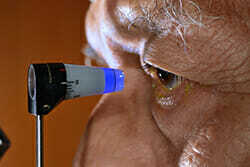 When glaucoma medicine fails, laser treatment may be necessary. A modern laser glaucoma treatment called argon laser trabeculoplasty (ALT) is now available at the Texas Eye and Laser Center. This procedure works well, lowering eye pressure and decreasing the need for eye medication in some cases. Argon Laser Trabeculoplasty (ALT) is a widely used treatment option for glaucoma management. By engaging in this laser technology, our doctors can now lower intraocular pressure and help patients avoid more invasive procedures. The surgical process begins with numbing the eye with topical eye drops so that you will not feel the laser treatment. A contact lens is applied, which will help the surgeon when applying the laser spots on the trabecular meshwork. After the procedure, anti-inflammatory drops are applied liberally to the eye. ALT lowers intraocular pressure (IOP) by using small, low-energy laser pulses to target cells in the trabecular mesh system of the eye.